The AnaSonde Blink-ETM and Buzz-ETM are variants of the basic AnaSonde-ETM, Anasphere's original low-cost radiosonde for making meteorological measurements in the lower atmosphere. The Blink-E and Buzz-E are very low-cost measurement devices optimized for use in the classroom and student laboratory. They also provide an excellent introduction to the fundamental features and capabilities of the AnaSonde radiosondes, without requiring the user to have any special skill or additional materials - the kit and a 9-volt battery are all you need to start making measurements and enter the world of AnaSondes! The Blink-E and Buzz-E are both based on a standard AnaSonde-E radiosonde circuit board. Each type measures temperature using an on-board temperature sensor. An on-board microcontroller takes the raw measurement from the sensor and converts it to a temperature in degrees Celsius. This number is then presented to the user via an on-board LED (Blink-E and Buzz-E) and can also be presented via an on-board speaker (Buzz-E only). The number is presented either in Morse Code or as a countable number of blinks or buzzes. This method of data presentation is useful in several ways. First, for those intending to move on to more advanced versions of AnaSondes, this technique provides an introduction to how the AnaSondes can transmit data over radios. It also provides an introduction to how numbers are presented by audio methods, and it is an easy step to go from listening to the data from a Buzz-E to listening to the Morse code transmissions from the more advanced AnaSondes. The data presentation methods are also of use in special-needs classrooms for blind or deaf students. Yes, even blind students have built AnaSondes from specially modified kits! The AnaSonde Blink-E and Buzz-E are based on the AnaSonde-E radiosonde. While the Blink-E and Buzz-E inherently have the full capability of the AnaSonde-E, at the present time we only offer the temperature measurement as a standard option, as the goal for these sensors is to provide the simplest possible introduction to the world of AnaSondes. Inclusion of other sensors (see optional configurations on the AnaSonde-E page) is possible upon request. The temperature measurement has a 1 degree Celsius resolution. The circuit board is 0.85 x 2.5 inches. The data is presented to the user via an on-board LED and via an on-board speaker. The number is presented as a series of blinks of the LED with corresponding audio tones from the speaker. The number is presented either in Morse Code or as a countable number of blinks or buzzes. In the latter case, the numbers 1-9 are simply presented as the corresponding number of blinks or buzzes; a special tone pattern indicates the digit zero, and another special tone pattern indicates a negative sign for temperatures below zero. There is no need for any associated software or other devices to receive data from the AnaSonde Buzz-E. Items Supplied With Each AnaSonde Buzz-E. 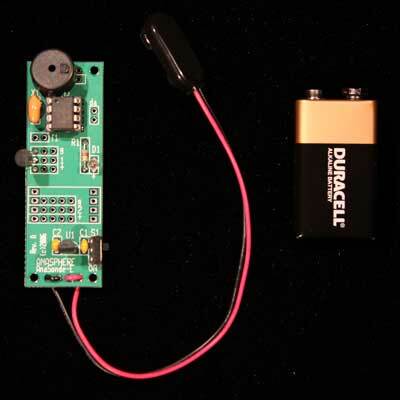 The AnaSonde Buzz-E is only offered in kit form; it consists of 11 parts plus a circuit board. All you need to add is a 9-volt battery. The temperature sensor should always be installed in Channel 1. NO AMATEUR RADIO CALL SIGN REQUIRED for the AnaSonde Blink-E and Buzz-E!